Cancer is a collection of related diseases in which some of the body’s cells begin to divide without stopping and spread into surrounding tissues. Erlanger’s comprehensive approach to cancer care starts with multidisciplinary tumor boards – weekly meetings in which top medical, surgical and radiation oncologists review each patient’s treatment options. And no team offers more innovative, life-saving options – backed by compassionate support from nurse navigators, dieticians and social workers. 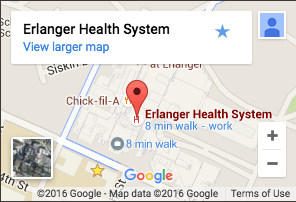 It adds up to a level of care that has earned UT Erlanger accreditation from the elite American College of Surgeons. 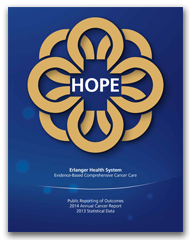 And as the region’s only teaching cancer center, Erlanger also stands apart by providing access to more clinical trials than anywhere in the region. CyberKnife® radio surgery – We’re the only regional cancer center with CyberKnife, a next-generation radiation technology that employs robotics to treat tumors painlessly with pinpoint accuracy. Many cases – including prostate cancer – can be cured in as few as five treatments. Minimally-invasive robotic surgery – Erlanger’s da Vinci “S” surgical system keeps incisions very small - while dramatically reducing hospitalization and recovery times. Cervical Cancer – Erlanger offers the widest range of treatments for cervical cancer, including the region’s only low and high-dose brachytherapy. Liver and Colon Cancers – We’re the region’s only provider to offer yttrium-90 (Y-90) for the treatment of liver cancer and metastatic colon cancer.